While Google Analytics was initially a godsend, other analytics companies have come along and are doing some terrific things with usability and analysis. One we completely fell in love with and find wildly addictive is Reinvigorate. Google is great if you’re running ads and tracking data regarding parallel AdWords Campaigns, however, we find the organization and hierarchy extremely cumbersome. 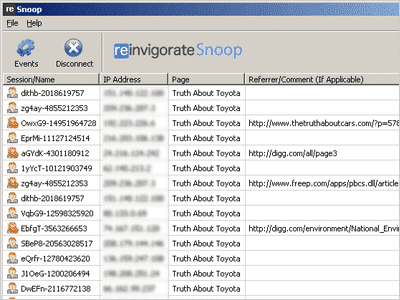 Reinvigorate is fast, clean and extremely intuitive. One enormous advantage with this application vs. Google is the real time information accessed online or via their desktop client. The real addiction, without a doubt, is the desktop client application – Snoop. This allows registered users to watch their site get accessed in real time and check out important things like visitor IPs and referrers. We did a launch yesterday and have been glued to the Snoop since!